6 games: The Sarien Encounter, Vohaul's Revenge, The Pirates of Pestulon, Roger Wilco and the Time Rippers, The Next Mutation, and The Spinal Frontier. It had been years and years since I played my brother's copies of Space Quest IV and V, and this was a terrific flashback for me! This is great for anyone who gets a sense of nostalgia from the old games. They haven't been redesigned or anything, just updated to run on current computers. It's not without its faults, though. There's a few minor visual glitches (I keep getting a "shadow" of the previous screen on mine every time it changes screens), and some faster computers may have issues with processor time--my processor was too fast to allow me to escape the time police guys in the mall scene, and I had to download a patch to fix it. If third parties have figured out how to fix the bugs, surely they could have done it themselves? I like the old space quest (SQ) games (SQ1 through SQ3). I guess one good thing about the old school graphics and no animation is that it forces you to be imaginative. The new ones (SQ4 through SQ6) have better graphics, but the animation and voice-overs are just annoying. Plus those in-game arcade sequences are horrendous. An amazing trip down memory lane! Space Quest... the ultimate computer geek fantasy game from the innocent days of young graphic adventures!! We spent hours and hours trying to get through the many adventures of Roger Wilco, which were filled with perplexing challenges, tongue-in-cheek humor, and some surprisingly great graphics (especially in the later episodes) that redefined gameplay as we knew it. I was ecstatic that these were re-released, and was mainly pleased with this incarnation. All episodes are offered in their entirety (even the annoying copy protection schemes!!) and online web sites can now cut down on your frustration by providing tons of hints =) Excellent job reviving these classics. Can't beat the original Sierra games! I haven't quite finished these games, but I think I like them. However, I'm fond of old games like these, while most people prefer newer stuff. I was disappointed that Space Quest I was a remake, and not the original. In its new form it was extremely easy, but worth it in my opinion. I have not finished Space Quest II, because of a small bug which prevents my progress (tech support has not been good about getting back to me), but I like it very much so far. The story lines of Space Quest III and IV reminded me of bad fan-fiction, but I mostly play for the puzzles and I enjoyed them. Space Quest V is my favorite right now; the play was great and the writers did a good job making the plot less ridiculous, but still tying it in with the previous games. I haven't quite finished Space Quest VI, but so far I am not impressed. The puzzles are more complicated and engaging, but it is almost not worth the playing. The plot and characters do not mesh well with those of the previous games, and the stupid attempts at 3-year-old humor are disgusting (people picking their noses, eating earwax, etc.). Furthermore, it seems someone forgot to include the entirety of this game's manual. Apparently, some information necessary to complete the game was supposed to be in the manual, but I had to find it in an on-line hint site. 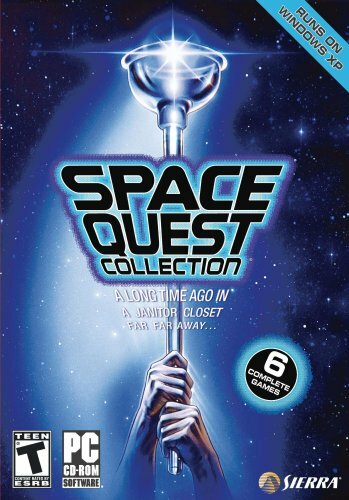 The Space Quest collection is a must for those ex-adventure gamers and Sierra fans from the `80s and early `90s. These were once the cutting edge of gaming. Space Quest was the first game we got for our PC and the color and pseudo-3D look was revolutionary. Sadly, this collection doesn't have the original EGA version of SQ1. The VGA update really wasn't much of an improvement for the most part (as it was with the King's Quest 1 VGA update). Many people will miss seeing the original. The puzzles and locations haven't changed, however. The classic parser interface will bring back memories from the pre-mouse era. SQ2 and SQ3 are also classics and I think the series reached its pinnacle with SQ3. Oddly the digital sound I had on my old Tandy SL2 is missing in SQ3. SQ4 introduced all voice and mouse interface. The mouse interface, first seen in Sierra's Rise of the Dragon, removed the inherent frustration factors in the parser-text system, though long-time adventure gamers probably took awhile to get use to it. The VGA graphics are great, but at times seem too static, too much like paintings and not enough animation. Granted, each Sierra game pushed the available technology. SQ5 is a mixed bag. The voice work and extensive digital sound of SQ4 is gone. The graphics seem crisper, but some animations seem to have fallen back to SQ1. The storyline is strong, though exploration on the various planets is limited. SQ6 brings back the superior sound design, updated mouse interface and superior graphics and animations. It would be the last game before the Sierra that we classic gamers knew, fell apart along with the market for classic adventure gaming. I don't know about the rest of you, but when I recently ordered my Space Quest (New) from AMazon, the game itself was great and works great only 1 issue: it looked used! First off, there was no shrinkwrap. Second, the box was basically empty except for the disc in a paper sleeve. and one small peice of paper with loading instructions. Other than that, the game is great and works well on Windows XP. A great resurrection of this classic game I enjoyed as a youth! Brings back memories. Our janitor hero is back!